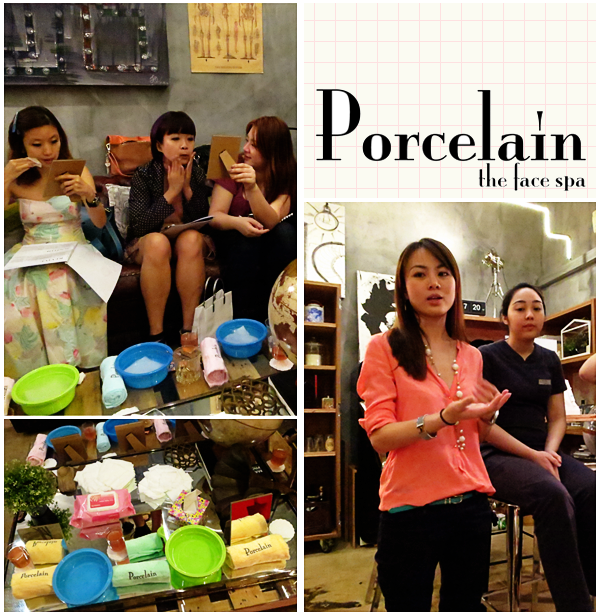 Sometime during the first week of October, I attended Porcelain, the Face Spa's The Party Perfect Skincare Workshop. Thank you, Kelvin, for the invitation (It was nice to see you again! :D)! Porcelain, the Face Spa was founded by mother-daughter duo, Jenny (Affectionately known as Auntie Jenny to her clients.) 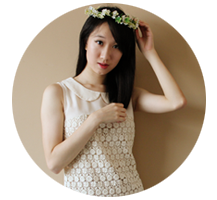 and Pauline Ng (The pretty lady in peach!). Before the birth of the salon, Jenny already had 20 years of experience in face treatments under her belt. Pauline, on the other hand, knew zilch about the beauty world and neither did she want to be part of it. But entrepreneurship was in her blood and it was only a matter of time before she took on the reins of Auntie Jenny's business. And so, Porcelain, the Face Spa was born. 1. No two skins are alike (and that's why the therapists are trained to fully customize each treatment). 2. 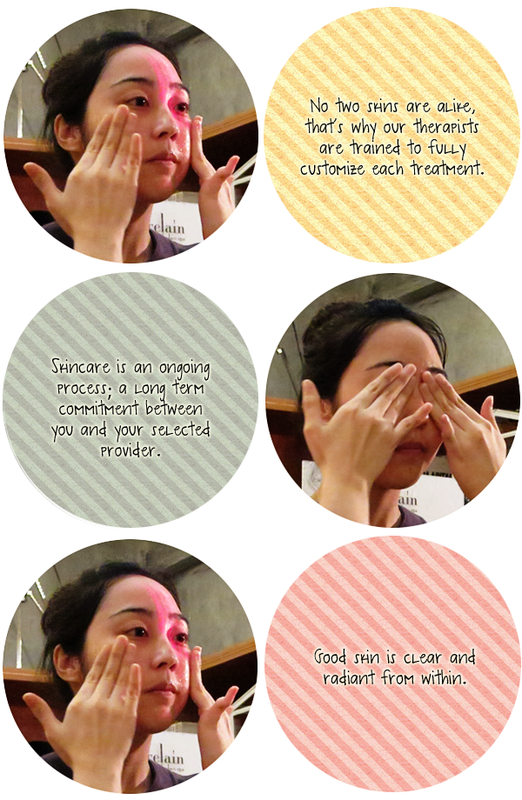 Skin care is an ongoing process; it is a long-term commitment between you and your selected provider. 3. Good skin is clear and radiant from within. And right from the beginning, Auntie Jenny and Pauline insist on a 'foundation-free' skin. At the workshop, Pauline and the therapists were wearing not a stitch of foundation. You could see their complexions as they were! You know... For those people who wear foundation frequently, their faces kind of have this pale, dull cast. Well, Pauline and the therapists sure didn't have that! Their skins, though there was a spot here and there (Some more than the rest. ), were healthy-looking! There were one or two therapist who had redness and bumps on their faces and of course, are currently undergoing treatments at Porcelain, the Face Spa. But I thought it was a really brave move for them to go barefaced because well, outsiders would be scrutinizing their faces. But fact is that Porcelain, the Face Spa wanted us to see the real deal. This is one of the reasons why I decided to go for the Quintessential Facial a couple of weeks later (More on this below!). 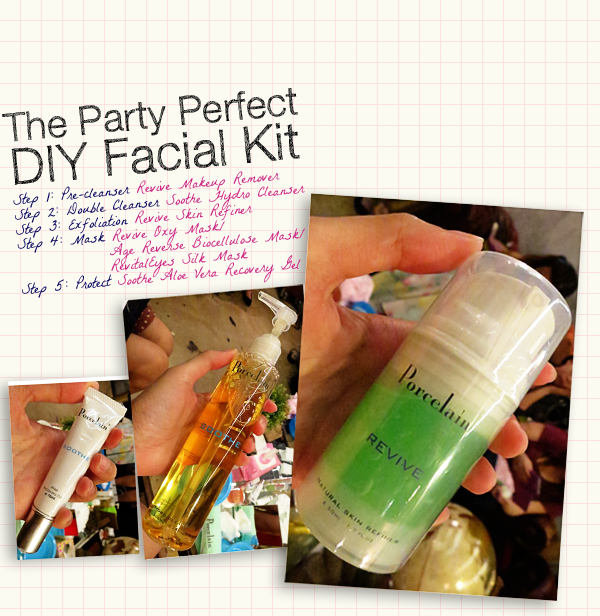 The Party Perfect Skincare Workshop was a feature on the recently launched Porcelain, the Face Spa's The Perfect Party DIY Facial Kit. This kit is a limited edition collection, specially designed for Christmas! Made up of just 5 simple steps, this little kit will set you on a journey of healthy skin from within! This parabens-and-sulfates-free cleanser contains 82% Aloe Vera Gel and hence, is perfect for even the most sensitive skin. It cleanses, hydrates and nourishes your skin with its 6 natural ingredients and infusion of powerful antioxidants and skin-conditioning agents. This skin refiner uses an advanced formula of enzymes, instead of micro beads, to eradicate dead skin cells by dissolving them. As you massage the product into your skin, it stimulates microcirculation and simultaneously, pumps nutrients deep into your skin. This mask is a rich blend of Ceramid 3, Sodium Hyaluronate, Butylene Lycol, Litchi Seed, Fig Fruit and Cactus Extract. It helps to hydrate your skin and restore its natural resilience. This mask helps to strengthen and repair the skin around the eyes with its blend of 4 types of peptides. Algae Extracts, Sodium Hyaluronate and Ceramide have also been added to help hydrate, alleviate puffiness and smooth wrinkles. This gel soothes and protects your skin from environmental stresses with its pure Aloe Vera Extracts formula. Improving your skin's overall moisture balance, this also helps repair wounds and increase its natural resilience. During the workshop, Pauline took us through the steps of the Party Perfect regimen. 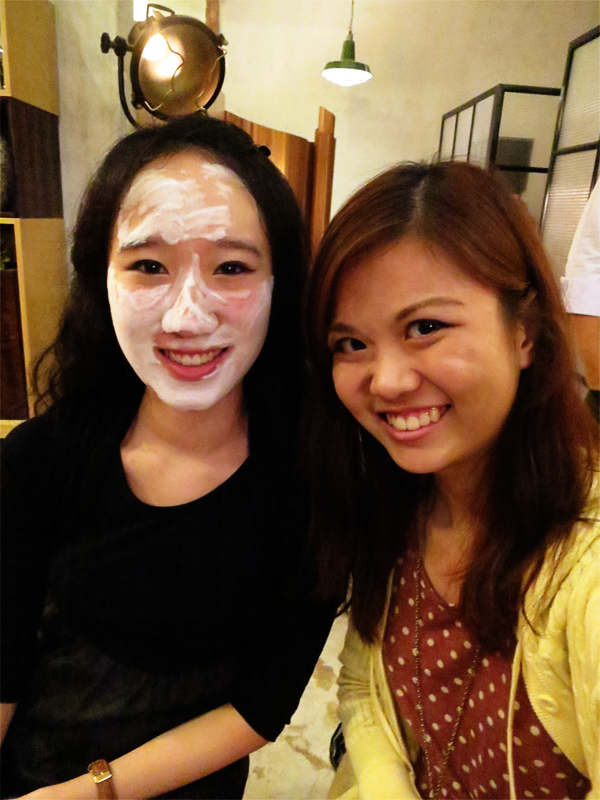 Nicole, who was my facial therapist, was the model of the day! Her skin is flawless! She told me her forehead had bumps but seriously, the naked eye can spot none! And here's me, bubbling up with the Revive Oxygen Mask, and Fel! Upon application, this mask bubbles up with a slight tingly feel. After a while, the bubbles disappear to reveal a radiant complexion! If you have read my other entries, I always make it a point to talk about brands' philosophies. I think it's important to know the roots of the brands so you get an idea of how their products are developed and also, see if you are comfortable with the brands on an 'emotional level'. For me, I don't just look for brands that are effective. I also want brands that 'speak' to me. And in this case, Porcelain, the Face Spa did and that's why I booked a facial with them within a month of the workshop. Just a note, the facial wasn't sponsored (I paid $60 for it, with Jones's coupon.) and neither was I asked to write about it. But here is my two cents' worth. I requested for Nicole to work on my face because I spoke with her the most during the workshop and also, I preferred a familiar face. Upon arrival at Porcelain, the Face Spa, Nicole brought me to a small, clean rectangular room with dim lights. After cleansing my face, she applied a blackhead removal gel all over my face and stuck strips of paper. These strips are perhaps the most effective answer to blackhead remover! So many tiny yucky stuff were removed and Nicole explained that this gel clings onto anything like a bear clings onto its honey. So, when you peel off the paper strips, the gel removes dirt from the roots. This is very much unlike the commercial strips, where sometimes, the dirt just breaks off midway during removal. Definitely,what a fantastic blog and enlightening posts,I definitely will bookmark your website.Best Regards!